All detectives seem to have a place where they can go and think. Waterloo Bridge features in most Bryant & May books as the place where resolutions are made, plans are arranged and cases are closed. Why there? Because, despite not being a particularly attractive destination in itself, it offers the best views of the city. In many cities you have to go up high to get a sense of what it looks like, but some – Vienna, Florence and Paris spring most to mind – you start at water level. Thanks to its location at a strategic bend in the Thames, the views of London include the Houses of Parliament, the South Bank and the London Eye, as well as Tower Bridge, St Paul’s and the City of London. The name of the bridge is in memory of the Anglo-Dutch/Prussian victory at the Battle of Waterloo, 1815. The earlier version had nine arches and was known as the Strand Bridge. Monet and Constable painted it. People threw themselves off it. Thomas Hood wrote ‘The Bridge of Sighs’ based on it (where a prostitute commits suicide). 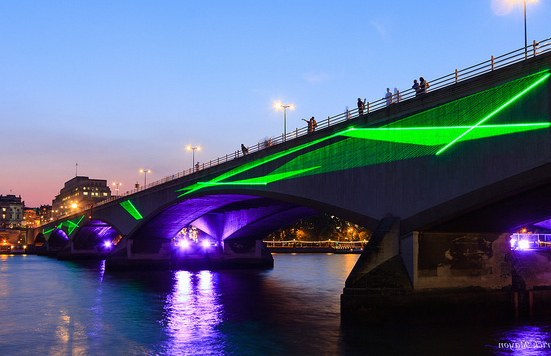 The new bridge was the only Thames bridge to have been damaged by German bombers during WWII. It was said that the work force was largely female and was sometimes known as ‘the Ladies’ Bridge’. It features at the very end of Bryant & May 12: ‘The Burning Man’. “Teasing” us? Tearing us up, rather! The “unofficial” tour guide on the Thames (all you’re paying for is transport to Greenwich) said that not only was the workforce largely female but the stone is Portland (?) stone which is self cleaning – trust the sensible women, he said. While still serving my sentence of labour, my last employment before time off for bad behaviour was working at Waterloo. Living in Hackney, I used the 26 bus (door to door, end-to-end -couldn’t oversleep on travelling home after night shift) and found that Waterloo Bridge was the best, the most magical view IN London, any time of day, any time of year, in either direction of travel. The best view OF London is either Primrose Hill or the top of Archway Road, both looking south in a panoramic sense. But Waterloo Bridge and its sweeping environs got me every time, tired or awake, going to work or coming home. I watched the city skyline change, and the dipping tower cranes represented to me both sides of the political spectrum. And walking across the Bridge, especially on a balmy summer evening, was even better. I don’t miss ‘work’, I do miss my daily fix of Waterloo Bridge.